Jay Walljasper is a writer and consultant who helps communities become stronger and brighter. He's sharing today's guest essay about the growth of bike infrastructure across the nation, an investment that will help individuals and cities become more financially frugal and resilient for decades to come. Find all our bike articles here. For me, a good bike ride is both relaxing and stimulating—a chance to revel in the passing scenery as I feel the wind blow across my face. But I never expected to experience this in New York City. Navigating Brooklyn and a bit of Manhattan on two wheels for the first time was a sublime surprise. Instead of constantly peering over my shoulder fearful of cars speeding toward me (as I expected), I actually savored the street life all around while pedaling through town. What made this ride so pleasurable and surprising is a well-connected grid of safe and comfortable bike routes featuring protected bike lanes on busy avenues and painted lanes on quieter streets. Built over the last decade as part of a methodical plan to improve biking in New York, this network explains Brooklyn’s doubling of bike commuters over just five years, 2009-2014. Those 10,000 new bike-commuting Brooklynites, not to mention the tens of thousands of others in the borough who now bike for shorter errands and social trips, are more than a trend. They're a model. “The next big idea for biking in the U.S. is building complete, connected networks of comfortable places to ride,” says Martha Roskowski, vice president of local innovation for the national bicycling advocacy coalition PeopleForBikes. “Most communities have bits and pieces of good bike routes. Maybe a nice pathway along the river, some quiet side streets, perhaps a few good bike lanes. But they’re pretty disconnected in most places, so people still don’t feel safe on bikes. For New York City, the payoff has been huge: new bike commuters in Brooklyn alone over five years are enough to jam 50 subway cars or pack the Brooklyn Bridge with autos for an hour straight. This new focus on filling in missing bikeway links — and, therefore, on the people who aren't currently biking — has been spreading across the country. Roskowski's group PeopleForBikes recently launched what it calls the Big Jump Project to help ten neighborhoods around the US show what’s possible when people on bikes experience the same level of comfort and ease that drivers have long enjoyed on American streets. The idea is that creating and promoting less stressful networks will trigger sizable increases in bicycling in these neighborhoods over the next three years, and offer practical models for cities everywhere to do the same. Austin is home to one of the 10 Big Jump neighborhoods. Another is in Fort Collins, Colorado. “Our goal is to make our bike system more accessible for people, a low-stress network that is family-friendly,” adds Tessa Greegor, manager for the bike program in Fort Collins. To accompany the Big Jump, PeopleForBikes and the planning and engineering firm Toole Design Group have teamed up to create a new procedure, called the Bicycle Network Analysis that looks at the location, connectivity and quality of any city's biking network to measure its strength. This information will help answer many of the key questions about the future of biking. Which cities have the best networks? Which cities' long-term plans have the most potential? And, most importantly, if a city wants the biggest biking boom for its buck, which missing links should be its top priorities? "Take a typical suburban residential neighborhood as an example," said Spencer Gardner, a Strong Towns member and planner for Toole Design Group who co-created the measurement tool. "Most of it is actually pretty comfortable for biking. But generally there are a few locations in the road network that are really important—meaning that they make connections possible from one place to another—that tend not to be very comfortable for biking. "Those couple miles of arterial roads are the most important piece of the network for making it possible for people to bike around your city," Gardner said. Biking experts agree that building complete networks (by closing missing links) and measuring them (with tools like the Bike Network Analysis) is essential. But they also agree it's not enough. After a century of building cities around cars, people need to be exposed to the idea that bikes can also be a practical, pleasant transportation way to get around. Peñalosa also points to Bogotá, Colombia—where he was parks commissioner in the 1990s and his brother Enrique is now mayor—which boasts one of the world’s most extensive bike networks with 250 miles of protected bikeways and another 250 miles under construction over the next three years. Around 400,000 bike trips are made around the city each day, significantly increasing traffic capacity on the city's streets. Closer to home, Calgary, Canada, offers a shining example of how connected bike networks can bring change fast—even in a sprawling city in a province whose oil and gas industry sometimes earns it the title “Texas of the North.” In 2014, the city council narrowly approved plans to create a 4-mile network of protected bike lanes on four downtown streets all at once. Within three months, bicycling on those streets doubled. Within a year, overall bicycle trips downtown soared 40 percent. City data found that the ratio of women biking downtown rose eight percentage points, while the number of people biking illegally on the sidewalks fell 16 percent. Delays for people driving were no more than 90 seconds, even during rush hour. A year after the network was built, two-thirds of all city residents supported it, and the city council voted 10-4 in December 2016 to make the changes permanent. “As we look at the data, more people are cycling, we’ve lowered the percentage of injury collisions throughout the core, and we’ve had pretty minimal impact on automobile traffic, so I’m quite pleased,” announced Mayor Naheed Nenshi, who noted he himself does not ride a bike. Last fall Edmonton—Calgary’s rival in NHL hockey and many other things—launched a similar project for its own downtown. 1. Protected Bike Lanes—The number of bike lanes where riders are physically separated from motor vehicles has skyrocketed in the US since 2009. There are more than 400 today in 82 cities across 34 states, with more being built all the time. Chicago alone has built 32 projects, and protected bike lanes are also appearing in suburbs like Hillsboro, Oregon, which features three routes, and smaller communities like Springdale, Arkansas, with two. Numerous studies document that protected bike lanes increase the rate of bicycling by an average of 75 percent, reduce bicycle and pedestrian injuries, relieve stress on the streets for drivers and spur economic growth in the neighborhoods where they are constructed. They generally are built along busy arterial streets, giving people safer access to businesses and other popular destinations. 2. Neighborhood Bikeways—Also known as "neighborhood greenways" or “bicycle boulevards,” these are low-speed side streets where biking and walking are given priority over driving through a series of design, engineering and landscaping measures that calm motor vehicles and discourage non-local auto traffic on these streets. Vancouver, British Columbia now sports more than 20 neighborhood bikeways, part of a 100-mile network that will eventually reach within a ten-minute bike ride of every resident. Portland, Oregon has built more than 70 miles so far, and Austin and Tucson are working on extensive networks of their own. Seattle took a step in this direction by lowering speed limits to 20 miles per hour on 2400 miles of residential streets across the city. 3. 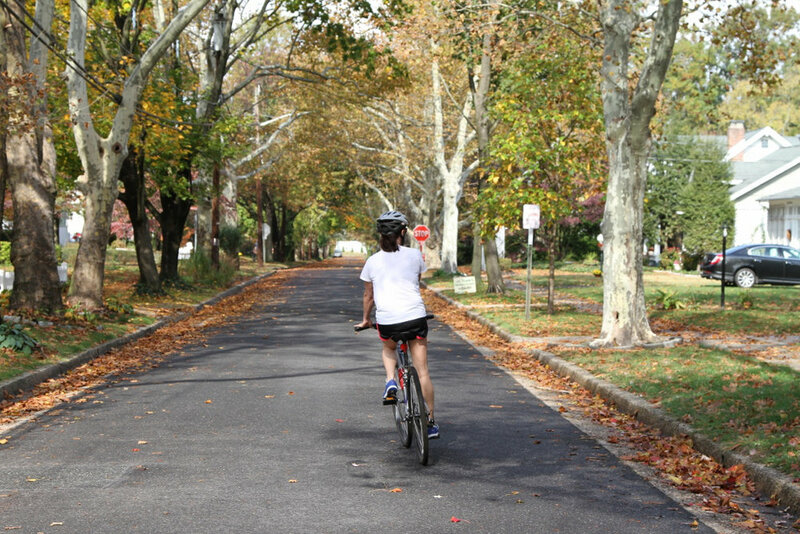 Shared-use Paths—These are off-road paths, such as rail trails and waterfront parkways, that are increasingly common for recreational riding across the country. Dayton, Ohio, for instance, boasts more than 330 miles of paved bike paths. Fayetteville, Arkansas, spends $1.5 million each year—6 percent of its entire capital budget—to continually expand its 40-mile trail network. These trails play an important role for transportation, too, especially when they are well-linked to protected bike lanes and neighborhood greenways. 4. 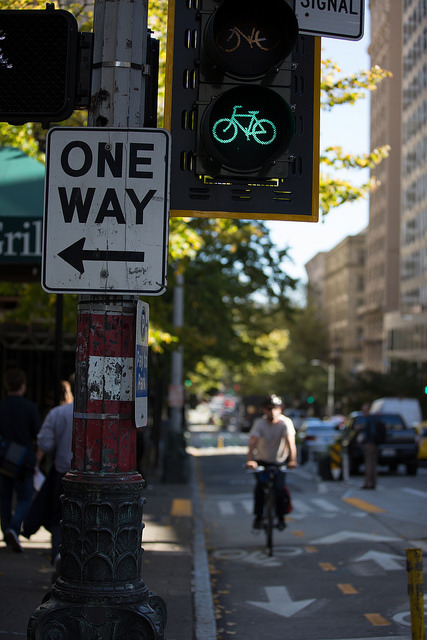 Safer Intersections—Most bike/car crashes happen where streets meet. Intersections can be made safer for biking, walking and driving with innovations such as special bike signals (which often give bikers a few seconds' head start so turning drivers notice them) and green painted bike lanes (which remind everyone that the intersection is shared space). At particularly dangerous crossings, another solution is to build underpasses that allow bikes to skip the intersection altogether, which Fort Collins is doing as part of its master plan to triple bikes on the streets by 2020. Salt Lake City, Austin and Davis, California (where bikes make up 20 percent of local traffic) have recently built the nation’s first protected intersections, which make a few design tweaks that rearrange traffic flow so people on bikes and in cars don't have to look over their shoulders for one another. “If I make it there, I’ll make it anywhere,” goes the old song “New York, New York.” And this is true for bicycling too. America’s biggest, most boisterous and densely settled city shows the important role bikes can play in 21st century life. On a typical day, close to a half-million bike rides are taken around the city, and more than 775,000 New Yorkers cycle regularly. The number of people riding bikes daily rose 80 percent from 2010 to 2015—the period when major bike improvements began appearing on the streets. The city’s growing network of connected bike routes accounts for these surprising numbers. Parts of Brooklyn offer a glimpse of what biking could feel like in the future. Never once did I feel threatened by traffic throughout my three-hour ride in and around Brooklyn—which covered the neighborhoods of Cobble Hill, Carroll Gardens, Park Slope, Prospect Heights, Williamsburg, the green expanses of Prospect Park, the old Navy Yard, into Manhattan on the Williamsburg bridge, around the Lower East Side and Chinatown, back over the Manhattan Bridge (where we ran into a bike traffic jam) then on to DUMBO, downtown Brooklyn and Boerum Hill. “The key to a good network is to put the lanes where people want to go, not just where it’s easy to build them,” Orcutt said. “The real beneficiaries of all this are the kids, who now have a place to ride, and the older people, who feel safer now that most bicyclists are off the sidewalks,” he added. “Yet it’s important to remember,” he continues, “that it’s not just hipsters out on those bikes, but also people like a 50-year old cleaning woman riding to work." Across the nation, cities are expanding stand-alone bike lanes into full networks everyday people actually like to use. Jay Walljasper—author of the Great Neighborhood Book and Urban-Writer in Residence at Augsburg College in Minneapolis— consults, writes and speaks about creating stronger, brighter communities. His website is JayWalljasper.com.